You can make a chart in Word. If you have lots of data to chart, create your chart in Excel, and then copy from Excel to another Office program. This is also the best way if your data changes regularly and you want your chart to always reflect the latest numbers. In that case, when you copy the chart, keep it linked to the original Excel file. To create a simple chart from scratch in Word, click Insert > Chart, and pick the chart you want. Click the chart type and then double-click the chart you want. Tip: For help deciding which chart is best for your data, see Available chart types. Tip: When you insert a chart, small buttons appear next to its upper-right corner. Use the Chart Elements button to show, hide, or format things like axis titles or data labels. Or use the Chart Styles button to quickly change the color or style of the chart. 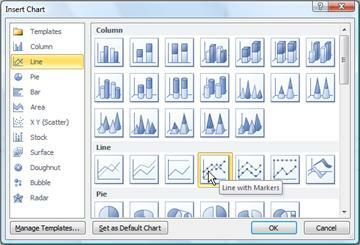 The Chart Filters button is a more advanced option that shows or hides data in your chart. If you want, use the Layout Options button to arrange the chart and text in your document. You can make a chart in Word or Excel. If you have lots of data to chart, create your chart in Excel, and then copy from Excel to another Office program. This is also the best way if your data changes regularly and you want your chart to always reflect the latest numbers. In that case, when you copy the chart, keep it linked to the original Excel file. 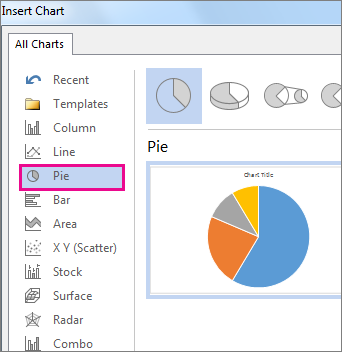 To create a simple chart from scratch in Word, click Insert > Chart and pick the chart you want. In Microsoft Word 2010, you can insert many kinds of data charts and graphs, such as column charts, line graphs, pie charts, bar charts, area graphs, scatter graphs, stock charts, surface charts, doughnut charts, bubble graphs, and radar graphs. Don't see the chart that you want in this article? For more information about the variety of graphs and charts you can use, see Available chart types. Want to create an organization chart? For more information about how to create organization charts, see Identify which program to use to create an organization chart. If Microsoft Excel 2010 isn't installed on your computer, you will not be able to take advantage of the advanced data charting capabilities in the Microsoft Office 2010. Instead, when you create a new data chart in Word 2010, Microsoft Graph opens. In the Insert Chart dialog box, click the arrows to scroll through the chart types. Select the type of chart that you want and then click OK. Tip: For more information on chart types, see Available chart types. 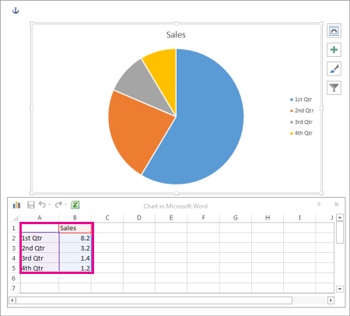 Edit the data in Excel 2010. When you are finished editing your data, you can close Excel. To get a good idea of what you can add to or change in your chart, under Chart Tools, click the Design, Layout, and Format tabs, and then explore the groups and options that are provided on each tab. Note: If you don't see the Chart Tools, make sure that you click anywhere inside the chart to activate it. You can also access design, layout, and formatting features that are available for specific chart elements (such as chart axes or the legend) by right-clicking those chart elements. To learn about the available chart types, see Available chart types. To edit data in your chart, see Change the data in an existing chart.